Netflix has become a powerful streamer. Michael Douglas’ new character very much wants to be one again. Symmetry is where you find it in The Kominsky Method, which devotes much of its third and fourth episodes to the joyless onslaught of frequent trickle-peeing courtesy of enlarged prostates. 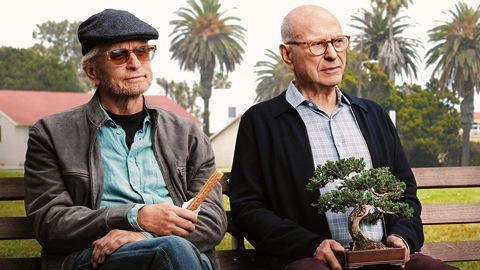 So yes, this eight-episode Netflix comedy from ace producer Chuck Lorre (The Big Bang Theory, Two and a Half Men) draws its strength from the travails of two advanced agers. Douglas, 74, plays respected acting coach Sandy Kominsky and Alan Arkin, 84, is his longtime agent and best friend, Norman Newlander. They crackle together, with Arkin in particular taking grousing and griping to new levels. A major death in the family (we won’t say who or when) can do that to you, although Norman already had been in a league of his own. Netflix made all eight Season One episodes available for review. They generally run closer to 30 minutes than 20 minutes each, but not always. Which makes bingeing the whole thing in one sitting a do-able proposition -- rest room trips included. Douglas wears his hair long and his stubble proudly as mentor to a group of mostly young students, save for one. Lisa (Nancy Travis) is considerably closer in age and therefore both suitable and susceptible in terms of Sandy’s other interests. She’s recently divorced and he has three exes. Where the series goes with their relationship is consistently refreshing and “adult” during what’s been quite a year for Travis’ under-appreciated talents. She’s also currently playing Tim Allen’s wife on Fox’s Last Man Standing and co-stars in the Audience network’s Mr. Mercedes series. Kominsky Method is more a bromance, though, even with Norman’s savy, salty wife, Eileen (Susan Sullivan), also long by his side. The two men still dine regularly at Hollywood’s ancient Musso & Frank’s eatery, where Norman sips martinis and Sandy has his Jack Daniels/Dr. Pepper concoction while a barely ambulatory waiter shuffles to and from their regular table. Their first bit of banter, a variation on the old Abbott & Costello “Who’s on First?” routine, is built around the rapper/actor Ludacris. It’s too labored to work very well, but they soon get on the same page even while seldom agreeing on much of anything. Arkin is a cinch Emmy nominee for his contributions and Douglas may well find himself along for that ride. The scenes with the acting class students for the most part don’t work as well. Sandy and his formerly estranged daughter Mindy (nice work by Sarah Baker) run The Kominsky Method studio in a nurturing fashion that could use a little more edge. Henry Winkler, who recently won his first Emmy as an acting coach in HBO’s Barry, was a more vividly rendered character with a bombastic temper fueled by delusions of grandeur. Sandy can get exasperated at times, particularly with a broadly drawn male goofball blonde named Jude (Graham Rogers). But he’s mostly simpatico -- and maybe too much so. The series is sautéed with brief appearances by familiar performers, some of whom play themselves (Elliott Gould, Patti LaBelle, Jay Leno, Eddie Money) and others as someone else (Ann-Margret, Danny DeVito). Lisa Edelstein recurs as Norman’s drug/alcohol-addicted daughter, Phoebe, for whom he has no patience but occasional remorse for being that way with her. Viewers of a certain age may well respond with knowing head nods to the age-old predicaments that Sandy and Norman find themselves in. But the series might also have some traction with advertiser-prized 18-to-49-year-olds. For whatever reasons, they’ve made Last Man Standing and Fox’s following The Cool Kids (which is set in a retirement home) Friday night’s two most popular broadcast network series among viewers in this demographic. Perhaps frequent urination is the new comedy gold? Kominsky Method ends with plenty of room for a second season. And why not? Netflix has gotten considerable mileage out of its other seniors gone wild comedy, Grace and Frankie. Its core cast of 80-year-old Jane Fonda, Lily Tomlin (79), Martin Sheen (78) and Sam Waterston (78) is by far the oldest in TV or streaming history. Their numbers are up. But as Douglas and Arkin prove anew, old pros are still capable of shifting into gear and then humming along despite all those incumbent aches, pains and spikes in bathroom breaks.